This post goes out to the one and only Kadie Whatley. Not only is she an awesome human being and friend, she also had the very smart suggestion of introducing me to the BST sandwich at Dave’s Pizza in Homewood. There’s no turning back now. Sometimes I just go there by myself, curl up in a corner (okay, okay…I sit at a table) and partake in the Bacon Spinach and Tomato sandwich all by myself. Sometimes I even get it in a wrap to lessen the guilt. You know, to count the carbs instead of counting the bacon and cheese…but whatever. 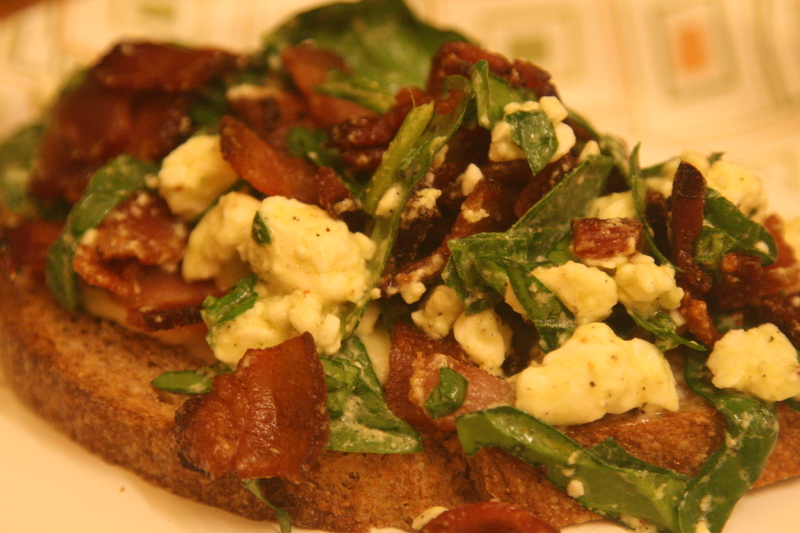 Basically, it is this delicious concoction of Bacon, Spinach (thank you, Dave’s Pizza for purposefully omitting the iceberg lettuce leaf–blech), Feta, Tomatoes, and who knows what else? It’s just stupid delicious. For real. Anyway, so there was the bacon. I had some sourdough bread. Then I thought: BST! I didn’t have tomatoes, so I settled for B(acon)S(pinach)F(eta)! I diced the spinach in ribbons (chiffonade-style), heated up the bacon crumbles, added some feta cheese, a little white balsamic vinegar, olive oil, and mixed together. Then I added a little bit of mayo to my sourdough bread, topped it with this amazing concoction, and just moved right through the rest of the evening like nothing ever happened. You, too, can make this sandwich. Be bold. Go crazy. You will thank me later.